Built strong and yet very lightweight, Kydex holsters are a go-to system for everyday carrying. 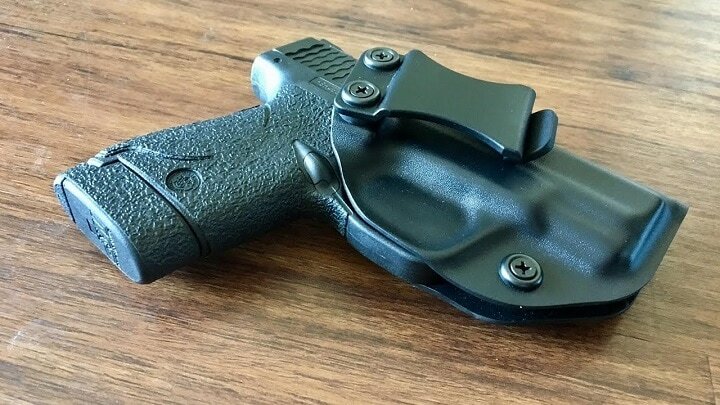 Let there be no mistake here, as a police officer, and now as an everyday carrying individual, I can say for a fact that there is only one primary drawback to a Kydex holster. Because these molded holsters have a rigid design, the holster will tend to be tough on the exterior finish of a firearm over time. I say this right up front because if the user decides to holster their prized Browning High Power with a vintage deep-blue finish, or a Colt National Match 45 Government, they are going to get a nasty surprise when they see the general surface wear. During the years I carried using Kydex products I tended to carry poly-framed guns that did not have any surface abrasive qualities to them at all. As the handguns were holstered day after day, the guns looked good in these holster types compared to the all-blue steel frame and slide weapons. 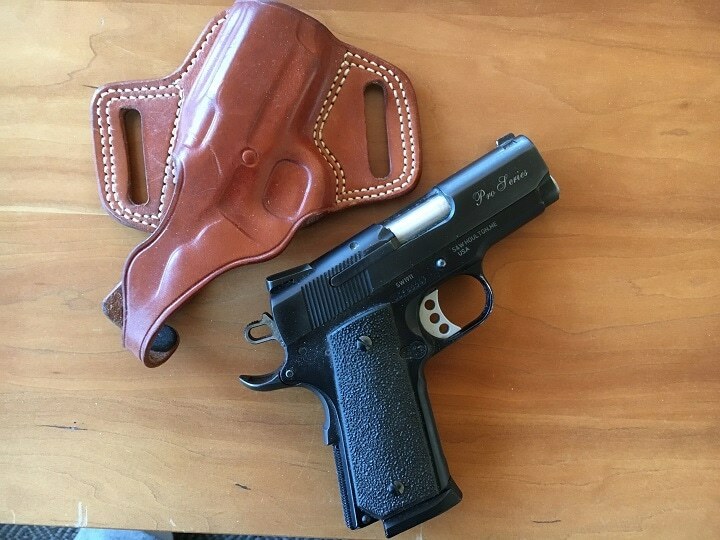 My Smith & Wesson Performance Center built Model 1911 45 ACP officers’ model had to switch to a lined leather holster very early so as to eliminate the possibility of damage inflicted by the hard surface material. 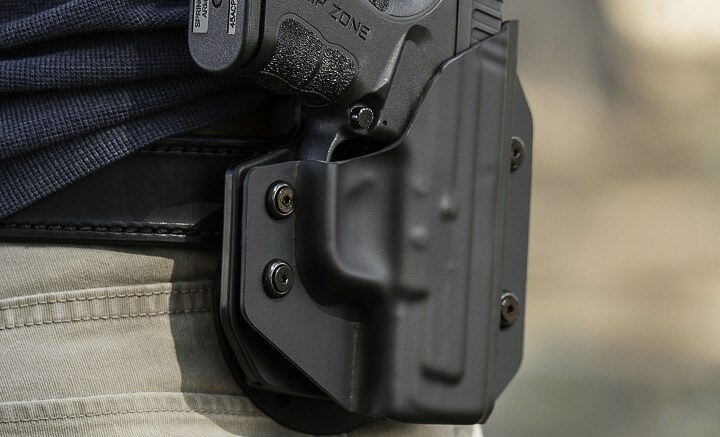 Therefore, I would strongly suggest that when using Kydex holsters the carrier should select stainless steel or poly materials that will eliminate, or at least minimize, the net effects of firearm holster wear. 2. Kobra Products Glock 19 Holster Gen 3-5 USA Made. 4. 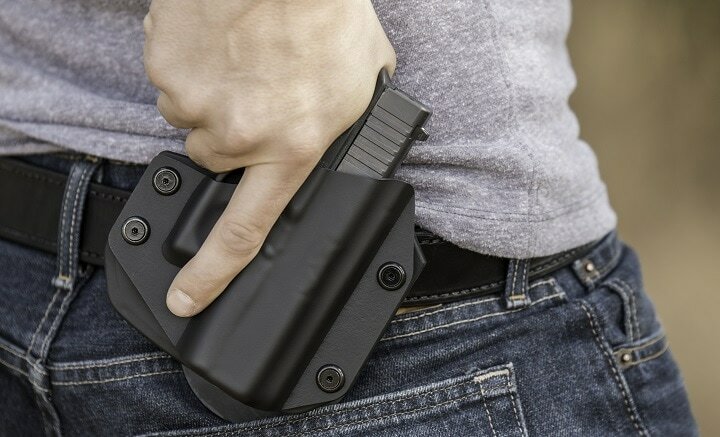 Fierce Defender “The Arbiter Series” - IWB Tuckable Kydex Holster. 6. 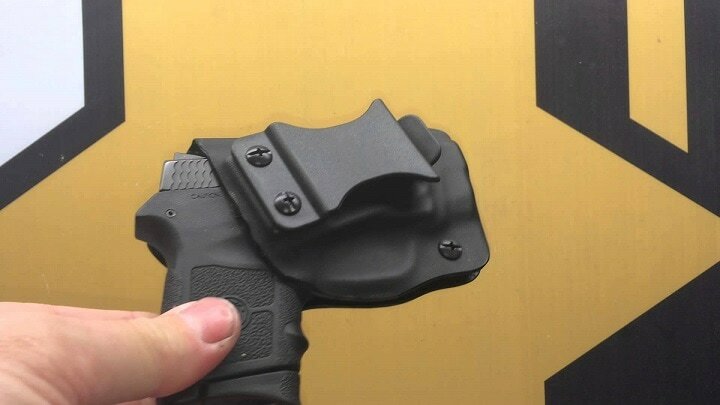 R&R Holsters OWB Kydex. 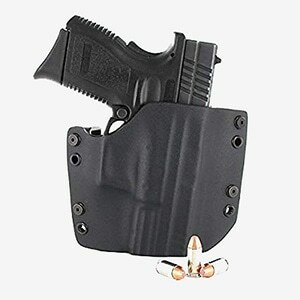 This holster is a waistband style AADJ Cant/Retention system. That means it will hold the firearm firm if there is a risk of dislodgment in an accident, or someone trying to take the gun away from the carrier. 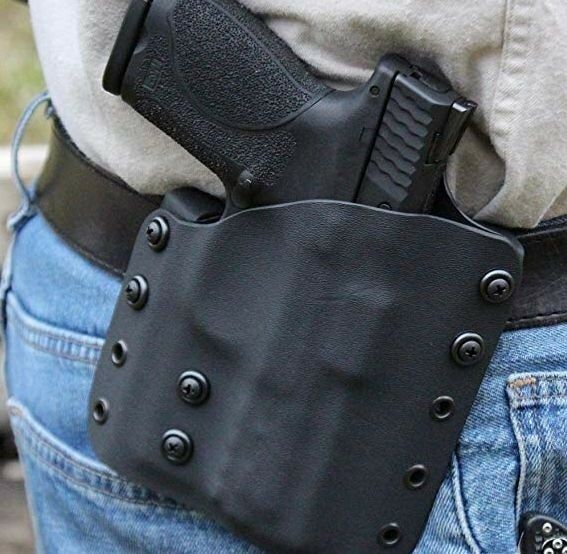 This holster is designed as a total concealment system, and that means it is not applicable to open carry situations (hunters, trappers, or general outdoors use). 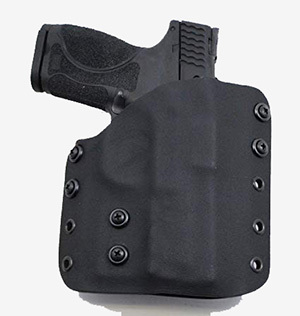 The waistband style holster is easy adjustable for individual comfort and ease of use, and the carry angle for drawing the weapon can be adjusted to fit the shooters needs. 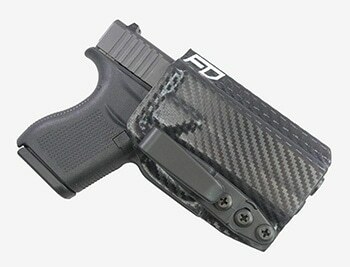 The holster material is 08 Kydex, designed and developed for the perfect fit every time regardless of the model of gun. However, the model must conform to the information contained with the holster. Position ‘click’ makes an audible sound when the firearm is secure within the holster. 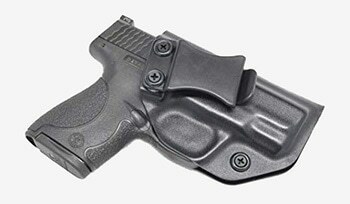 This concealment system holster is designed for a wide variety of pistols. The price of Concealment Express varies, so check the latest price at Amazon. 2. 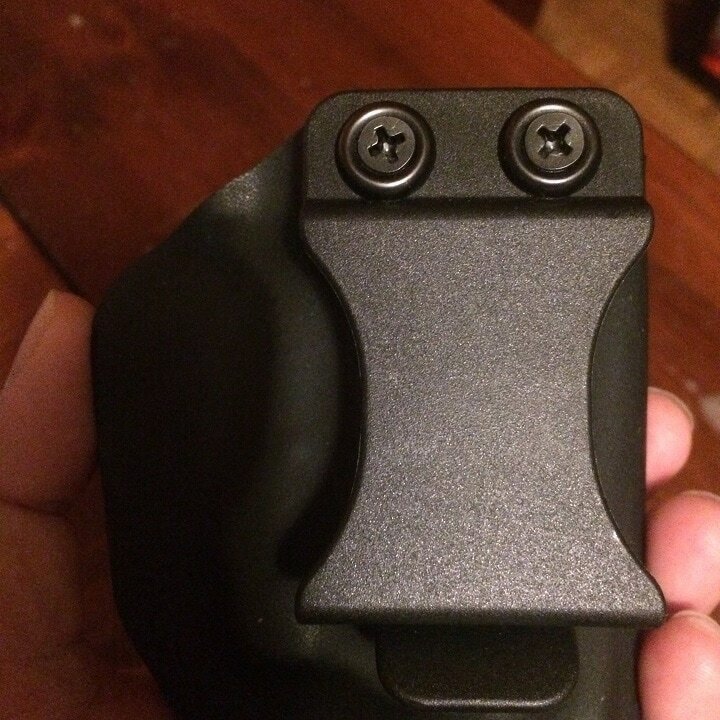 Kobra Glock 19 Holster Gen 3-5 USA Made. This Kobra holster is again a Kydex holster that has been designed for carrying a concealed weapon inside the pants with a left-hand draw. The holster fits Glock 19, 23, and 32 as well as all stainless steel and powder coated hardware with a weight of 8 ounces. The belt clip is 1.5 inches wide, with an audible retention system designed in the holster. The holster comes with a 100% lifetime warranty, and if there is an issue with the holster at any time the company will make it right. The price of Kobra Products Holster varies, so check the latest price at Amazon. 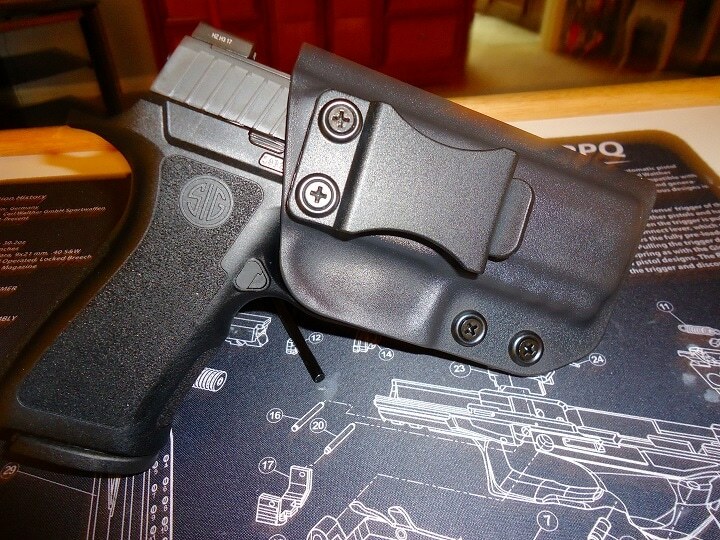 This holster fits Smith & Wesson M&P Shield 9mm /40. This fit includes M2.0, and Performance Center weapons without lights or lasers. 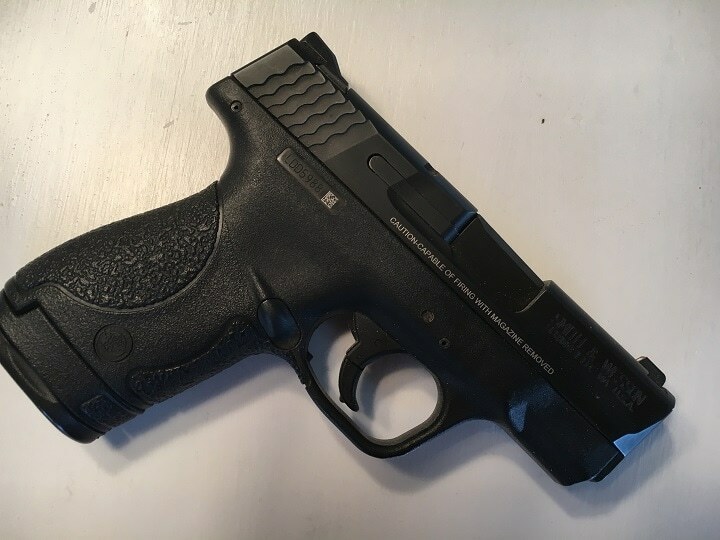 Authors S&W Shield 9mm compact. Th carry method for this holster is hip, cross draw, palm- in back. This is a UWB system (inside the waistband,) and completely adjustable. In terms of retention pressure, carry angle adjustments can be completed by way of simple tools. Positive audible click against the retention lock, a 1.5” belt clip installed, black oxide treated hardware. The price of Concealment Express S&W holster varies, so check the latest price at Amazon. This holster is for a short concealable Glock 43 and, as such, the holster is tuckable behind a shirt or any upper garment by the carrier. 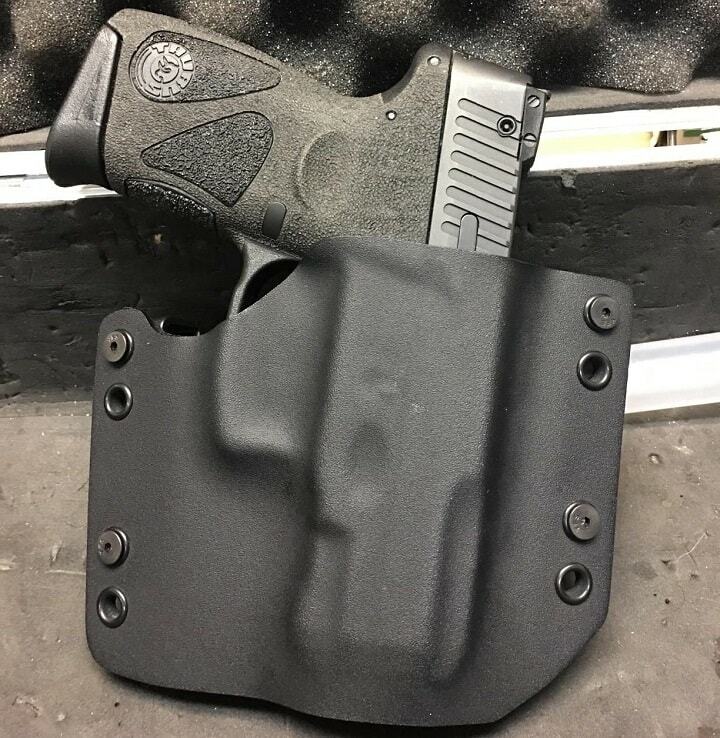 Made of thick .08 Kydex material, the holster is molded specifically for the Glock 43. Designed with adjustable retention pressure, with a flared holster opening to allow easy re-holstering of the weapon. This is a nice special feature as Glocks, as well as other handguns of this style, are not exactly streamlined in terms of exterior design, and a holster designed to deal with this issue is a welcome additional to the market. The price of Fierce Defender holster varies, so check the latest price at Amazon. 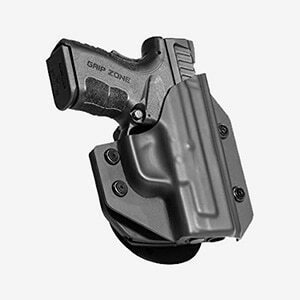 This Gunwear Kydex holster is tactical based for S&W 2.0 Compact weapons. 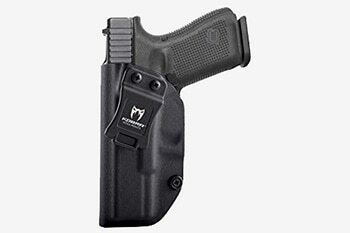 Made of .08 weight Kydex material, the holster is durable, fully adjustable for height and cant with the turn of a few simple screws. Tension screws allow the shooter to adjust the holster for the amount of desired draw tension. The price of CCS Gunwear K2A varies, so check the latest price at Amazon. The R7R holster is built to hold a Government Model 1911 45 or 9mm 3” barrel length weapon – Taurus 1911 Officers Model, Smith & Wesson Performance Center Sub Compact1911 45 ACP, or others of the same style Government frame. Authors S&W 45 Sub Compact. With an adjustable cant from 0 to 15 degrees, the gun can be set to fit the shooter where they want it positioned. Designed with a partial sweat guard backing the holster can be comfortable even in wet or very warm weather. Made in the USA the holster is warranty listed with one year replacement in the event of an issue. The price of R&R Holsters OWB Kydex varies, so check the latest price at Amazon. This Allen Gear holster is designed for wearing outside pants so is very suitable for people working outside. Adjustable as a high ride paddle holster this is my preferred style of carry system for both speed and convenience. I don't like guns rubbing on my body when I sit or walk. The paddle covers this issue completely. Just a loose shirt or jacket can work well to keep the weapon covered. Available in both right- or left-hand for the S&W Shield 9mm auto, built with an open mouth design for quick access or re-holstering, this holster system is well thought out. 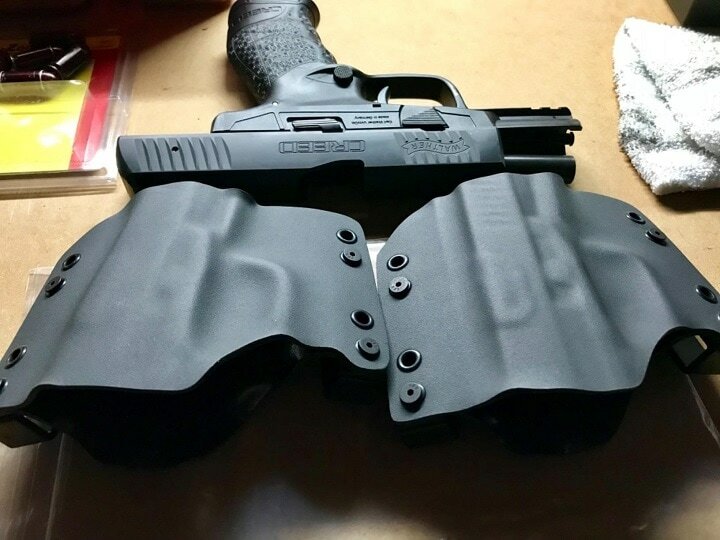 The holster can be carried as a belt slide style or slip over paddle holster. The holster comes with a 30 day ‘test drive’, and a lifetime warranty. Buy a new handgun and Allen will refit your old holster to the new weapon at no charge. 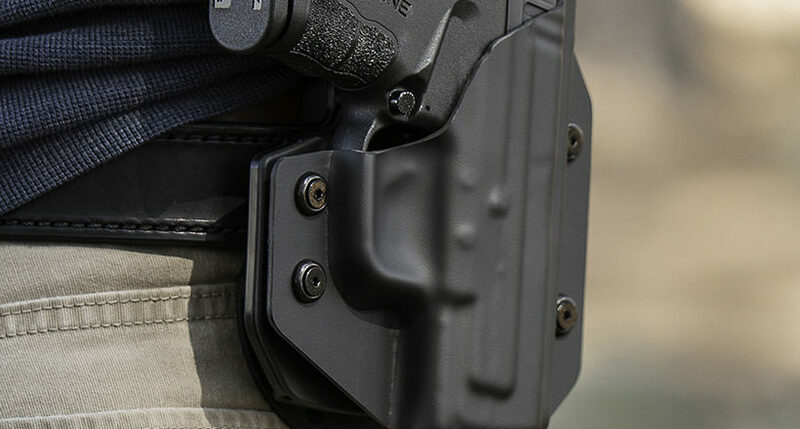 The holster is NOT Kydex, but should be considered for competition, outdoor activities, and general carry options. The price of Allen Gear holster varies, so check the latest price at Amazon. The Do's and Don't of Holster Buying Today. 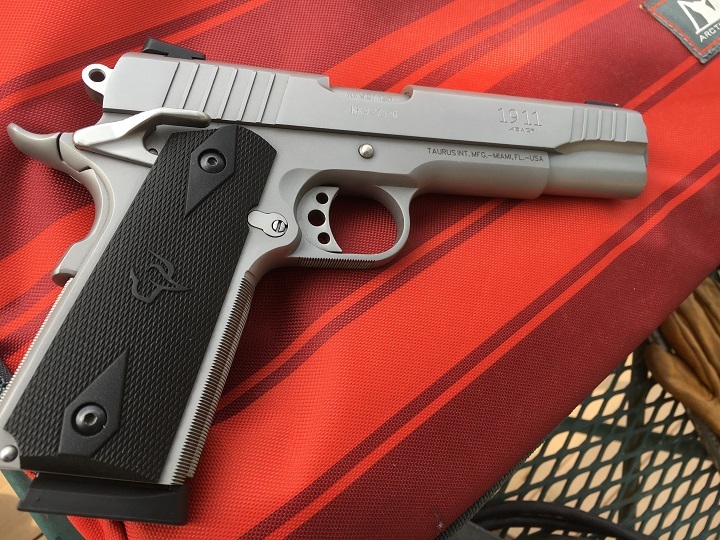 Taurus Government Model 45 ACP in Stainless Steel. This weapon can take on any holster and stay good looking. 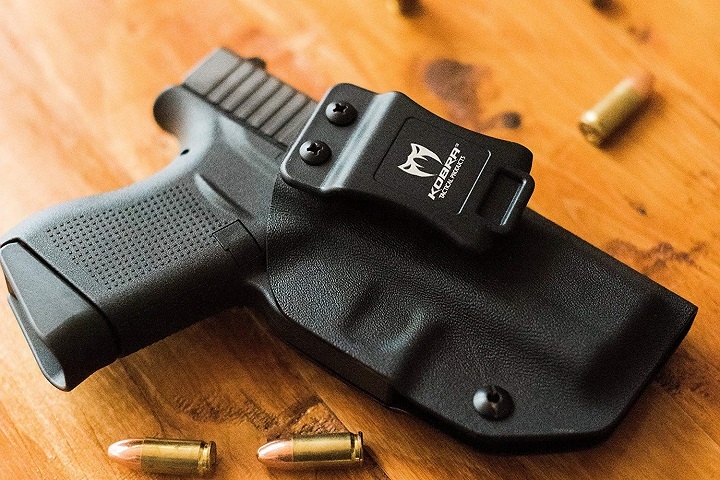 There is a general theme when reviewing these hard-shell molded style holsters. As I indicated at the beginning of this article, holsters are being designed for a very specific types of weapons. The new age auto is not very well dressed, block shaped, and for the most part a very straight forward utility weapon with little or no creative class to fit the profile here. Sorry boys and girls, but I came from the era of Colt Gold Cup National Match, Browning High Power, 08 German Lugers, and Colt Diamondbacks or Pythons. Those day as are now gone in favor of something quite different. Holsters and the weapons have become totally utility based. 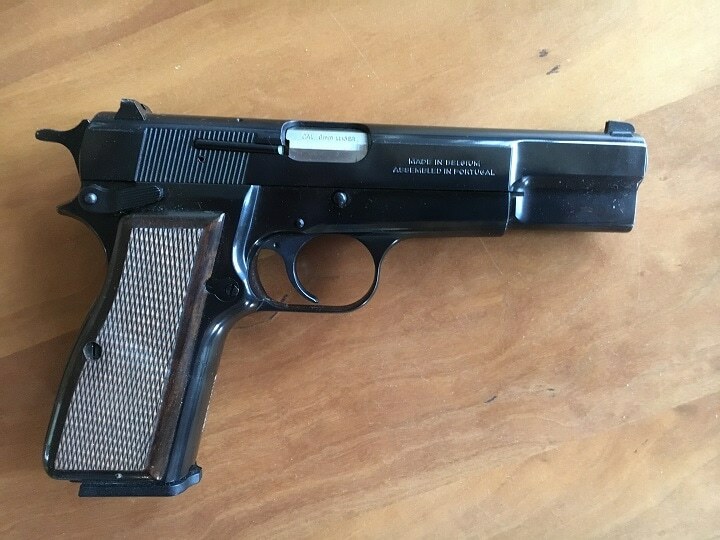 Browning High Power. This weapon can take the effects of a hard-shell holster. As I said earlier, choose your weapon and holster combination with care. The wrong holster used for a weapon designed with class and grace is not a workable combination here, and will be headed for disaster regarding the overall wear effect on the firearm itself. In some cases, a quality leather lined holster is a must.